Fallen Leaves is a collection of Abbott’s wartime letters to his family and friends, the majority published here for the first time. Robert Garth Scott’s introduction contains a biographical sketch of Abbott that offers the most complete account of his life to date and, in his epilogue, recounts the details of Abbott’s final battle and death. Also published with the letters are more than 30 photographs, many of them showing members of the 20th Massachusetts. Abbott’s letters convey an immediacy which gives readers a sense of being part of an inner circle of friends and relatives. This quality lends itself to fresh and compelling reading for Civil War scholars, buffs, and general readers alike. Djelloul Marbrook started writing poems in Manhattan when he was fourteen. In his thirties he abandoned poetry after publishing a few poems in small journals, but he never stopped reading and studying poetry. Then at age sixty-seven, appalled by the 9/11 terrorist attacks, the poet within awakened. Stuffing sky-blue notebooks in his pockets, Marbrook began walking around Manhattan determined to affirm his beloved home in the wake of the nihilistic attacks. Far from Algiers emerged from hundreds of poems he has composed in the years since. Various factors in late 16th-century England contributed to an environment more hospitable to prose fiction than had existed previously-among them, changes in educational opportunities, socioeconomic structures, literacy rates, and access to European literature. Such cultural alterations inevitably produced changes in modes of literary production. Furthermore, access to the bookstall to a new class of readers altered the structures and subjects writers employed. Within this tumultuous context, the writers of fictional prose narrative negotiated-for themselves and their audience a precarious definition of their identity within the Elizabethan literary world. In Fashioning Authority Constance C. Relihan examines the influence of Elizabethan prose fiction on early modern literary culture, emphasizing the role of the nonaristocratic reader in the reception of literature, the importance of the marketplace in the production and reception of prose texts, and the growth of prose as the dominant mode of narrative presentation. While visiting with Mr. Tumnus in The Lion, the Witch and the Wardrobe, Lucy Pevensie notices a bookshelf filled with such titles as Nymphs and Their Ways and Is Man a Myth? Beginning with these imaginary texts, Charlie W. Starr offers a comprehensive study of C. S. Lewis’s theory of myth, including his views on Greek and Norse mythology, the origins of myth, and the implications of myth on thought, art, gender, theology, and literary and linguistic theory. For Lewis, myth represents an ancient mode of thought focused in the imagination—a mode that became the key that ultimately brought Lewis to his belief in Jesus Christ as the myth become fact. 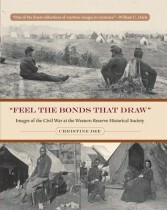 “Feel the Bonds That Draw” presents nearly 200 images from the extensive Civil War photographic collections of Cleveland’s Western Reserve Historical Society, complementing author Christine Dee’s reflections on topics such as historical memory, the war as economic engine, and the impact of mobilization and combat on civilians and the environment. “Feel the Bonds That Draw” is a fine addition to the library of anyone interested in the history of America’s cruelest conflict. Fernando Wood was one of the most controversial figures of nineteenth-century America. His fellow New Yorkers either respected or despised him, depending whether they considered his policies beneficial or harmful to their interests. The character revealed herein possessed some admirable qualities; high intelligence, sharp analytic skills, great capacity for hard work, and a clear talent to set his ex3ecutive agenda. But equally evident are Wood’s less admirable qualities; ruthless business practices, shoddy personal ethics, corrupt politics, dictatorial tendencies. What emerges is the story of a very complex person: a successful businessman, consummate politician, resourceful three-time may of New York City, and nine-term congressman, beneath which lurked mean and self-destructive tendencies.